Hurry, this offer expires Sunday May 12th! Not in the mood for cooking? Are you in the mood for some great food? 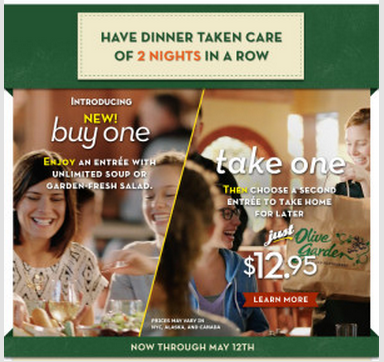 Olive Garden is your answer, and with this special deal, you’ll get a choice of Buy One/Take One. Get out with a group of your friends, or a family meal for dinner. You’ll get the new buy one! Enjoy an Entree with unlimited soup or salad and then you get to choose a second Entree to take home for later OR tomorrow for just $12.95. They also have great lunch combinations starting at just $6.95, you just can’t beat that! Get out of your kitchen today and enjoy an evening free of preparation and cleanup.